The Red River in Vietnam supports 20 million inhabitants, includes a major rice-growing region, the mega-city of Hanoi and a range of industries each of which have expanded in recent decades. The Red River Delta (RRD) delta area of the river is the agricultural heartland of the region and provides crucial ecosystem services, including the retention and removal of nutrients and pollutants for groundwater (drinking water) and marine resource protection, carbon processing and flood protection. With increasing upstream and downstream pressures on this resource, the aim of our research is to assess the current status of riverine physical parameters, ecology and pollution (e.g. nutrient loading, heavy metals) as a means to best mitigate against further impacts (e.g. climate change and the future expansion of Hanoi). Our trip began with meetings with the Directors of the different institutes of VAST. A tour of the VAST facilities was given and an introduction to other colleagues at the Institute who also have an active research interest in the RRD. On day two, we hit the field, how quick was that! 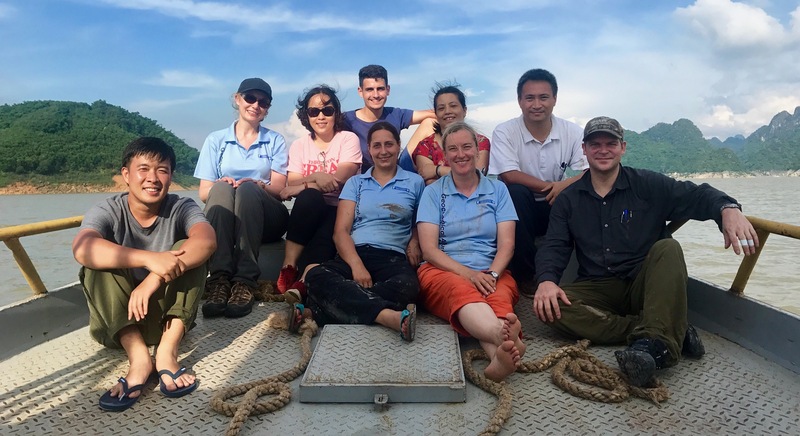 Having gathered all of our research equipment the team set off to sample (for waters and sediments) the upstream reaches of the Red River and its tributaries (the rivers Da, Thao and Lo). Along the way we engaged with stakeholders including meteorological monitoring stations situated on the river banks. 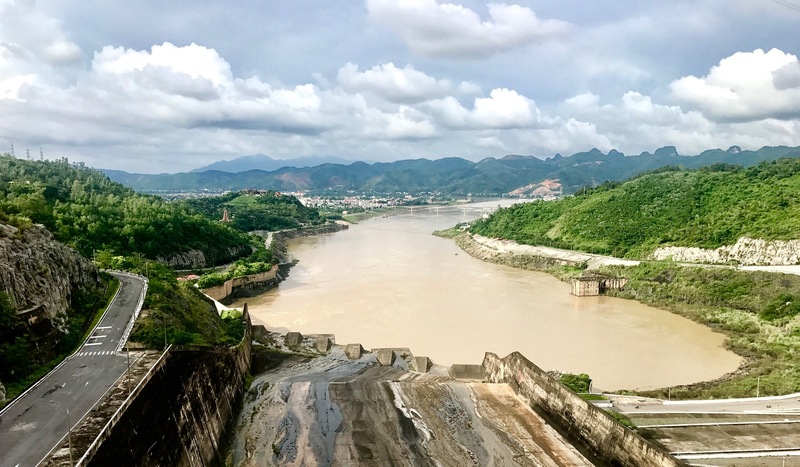 Our first overnight stop was Hoa Binh Reservoir on the Da river, where we were given a tour of the inside workings of the hydropower dam built in 1988. Until recently and during its peak capacity, this dam had the potential to provide most of Vietnam’s power. An impressive feat! However, the downstream implications of this intensive river management (reduced nutrient and sediment delivery) have been noticed and one of our work packages is to asses the rates of these changes via palaeolimnological techniques. The following day the team collected 4 sediment cores from the deepest reaches of the reservoir. This was quite a challenge given the size of the reservoir and involved reaching a depth of 80 m. Nevertheless, this was a great success and the team extruded the cores on site ready for storage and future analyses on biogenic silica content, organic stable isotopes, algal biomarkers and particle size analysis. The following days we traveled to the other tributaries of the Red River Delta (RRD), along the Thao and Lo rivers. Further cores were also collected from Thac Ba reservoir before returning to Hanoi. The final stages of our fieldtrip involved visiting the lowland regions of the RRD. Here the noticeable shift in land use was seen from Acacia, tea and rubber forestry (upstream) to one of lowland rice paddy fields and shrimp farms. A total of 6 sites were visited from close to the mouth of the Day estuary to more upstream locations, south of Hanoi. Noticeable differences could be seen just in the colour of the waters as well as dissolved oxygen content, compared to sites upstream of Hanoi, indicating the impacts that intensive agricultural practices and pollution sources have had on the waters of the RRD. At the final meeting at the end of the visit some key decisions were made on future sampling and laboratory practices and procedures over the next two years of the project. The UK partners will be visiting Vietnam again in Spring 2018 to conduct the next wave of river sediment sampling, as part of our pollution impacts work package. Overall, we had a thoroughly enjoyable and exciting field campaign and we are in no doubt that this will lead to a very fruitful collaboration between the partners and future PhD students on the project. Ginnie Panizzo is a Research Fellow at the University of Nottingham and Visiting Research Associate at the BGS. Take a look at the Red River Project Facebook page. 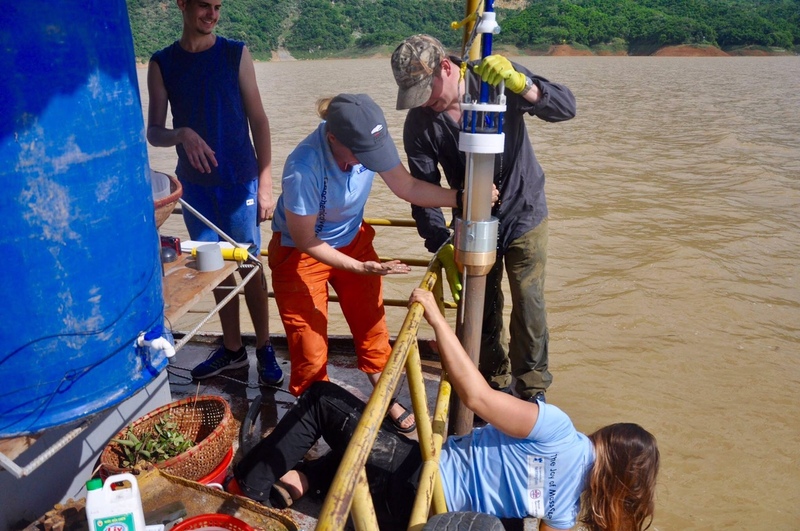 Click on the Video to see the team collecting sediment cores from Hoa Binh reservoir.